A European Capital of Culture Ruhr region 2010 event at Campus Museum, Ruhr University Bochum, Germany. On the occasion of the European Capital of Culture RUHR region 2010 events, media artist Mischa Kuball is presenting a 1200 sq. m. installation NEW POTT 100 Lights/100 Faces at the Campus Museum, Ruhr University Bochum in Bochum, Germany. This installation, consisting of 100 photograph-pairs and documentary videos, approaches one the culture capital’s themes “Mapping the Region” and explores current immigration in the Ruhr region. (This area north of Düsseldorf in Western Germany has a population estimated at 5.2 million inhabitants (2008), within a 150-year history of immigration. An estimated 12% of current inhabitants come have non-German backgrounds.) The large scale work is integrated throughout the museum collection which exhibits a selection of modern works by international artists including Bruce Nauman, Donald Judd, Richard Serra, as well as Greco-Roman antiquities. Mischa Kuball. 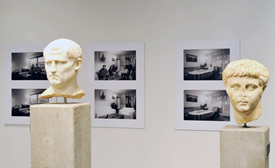 (From left to right in background:) "From Vietnam: Sebastian & Stephanie", "From Romania: Smaranda, Anna, Robert, Gunnar, Henning" and "From Russia: Otto" (Photographic details from NEW POTT installation) (2010), as installed in Campus Museum, Ruhr University Bochum. Fine art prints on Alu Dibond, 50 x 80cm each. Image courtesy of Mischa Kuball. Mischa Kuball. 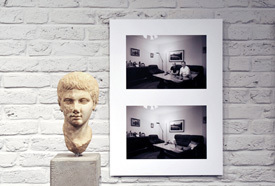 "From England: Peter & Danny" (Photograph detail from NEW POTT installation) (2010), as installed in Campus Museum, Ruhr University Bochum. Fine art print on Alu Dibond, 50 x 80cm. Image courtesy of Mischa Kuball. Video of William from Liberia, interviewed for Kuball’s installation, NEW POTT 100 Lights/100 Faces. NEW POTT 100 Lights/100 Faces (“NEW POTT” roughly translates to “new melting pot”) consists of 100 sets of comparative photography of migrants/immigrants in their domestic interior juxtaposed against their interior, empty, to highlight the space and their contribution to multi-cultural Ruhr region society. For the project, 100 families from 100 nations—other countries in Europe and those on other continents—were interviewed on camera in their homes and photographed. 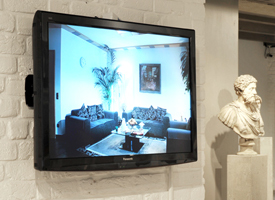 The documentary interviews are incorporated into the installation via three video monitors. Bright floor lamps in the photographs have two functions: a floor lamp was given to each immigrant-participant in exchange for a lamp in their interior; and the lamp symbolically transforms the immediate space into a stage-platform upon which stories of life, migration and the reality of being in between two cultures are told. NEW POTT 100 Lights/100 Faces refers to an earlier project by Kuball, Private Light/Public Light at the 1998 São Paulo Biennial. In this project, 72 families in São Paulo were invited to exchange their living room lights with a standardised lamp developed by Kuball which became metaphors contributing to a sculptural-installation. This project is generously supported by North Rhine-Westphalia’s Ministry for Family, Children, Youth, Culture and Sport; RWE Foundation and RUHR.2010 GmbH; Sparkassen-Finanzgruppe, and artdesigncafe.com. 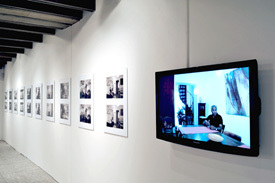 Installation view of video monitor (detail) showing interviews from the NEW POTT project, installed at Campus Museum, Ruhr University Bochum and integrated into the collection, on the occasion of the Ruhr region European Capital of Culture 2010 designation. Image courtesy of Mischa Kuball. Video of Timo & Indira from Malaysia, interviewed for Kuball’s installation, NEW POTT 100 Lights/100 Faces. Installation view of NEW POTT by Mischa Kuball, installed at the Kunstsammlungen der Ruhr-Universität Bochum, Germany (2010-11). Image courtesy of Mischa Kuball. Naveed from Pakistan, interviewed for Kuball’s installation, NEW POTT 100 Lights/100 Faces. Mischa Kuball. Private light, public light, 1998. Installation at the São Paulo Biennial. Image courtesy of Mischa Kuball. Mischa Kuball. Refraction house, (1994). Projekt Synagoge Sommeln, near Cologne, Germany. Image courtesy of Mischa Kuball. 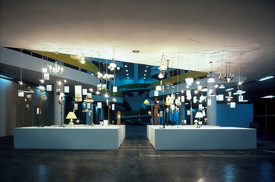 Previously Kuball has exhibited installations internationally in several group exhibitions including those at the NTT Intercommunication Center in Tokyo (2008), Hamburger Kunsthalle (2007), the Jewish Museum, New York (2002), and the Bauhaus Dessau (1992). Temporary installations of his work have been installed at the entrances of the Museum K20K21 in Düsseldorf (2005), the National Gallery in Berlin (1999), and most recently at the Centre Pompidou-Metz (2010). He has also positioned site-specific installations on bridges in Berlin and Geneva, and in/on a 23-story office building in Düsseldorf. Among Kuball’s recent solo exhibitions include those at the Chinati Foundation in Marfa, Texas, (2009), the Contemporary Art Museum in Toyota, Japan (2008), and at the Gallery of Modern Art in Glasgow, Scotland (2005). Kuball also contributed two site-specific installation for détournement 2009, a collateral exhibition at the Venice Biennial 2009. 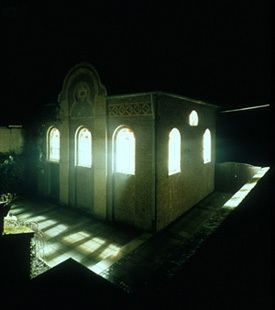 In 1994, Kuball saturated the Projekt Synagoge Sommeln (1994) near Cologne with light, from the inside-out, to “project a strong presence with its symbolism”. He considers this a breakthrough work in his artistic practice. For more information about NEW POTT 100 Lights/100 Faces, or image requests, contact Sandra Höptner at hoeptner [*at*] mischakuball [*point*] com or in Düsseldorf at 49-211-371-402. Persons interviewed and photographed for the NEW POTT project comes from the following countries: Abkhazia, Afghanistan, Algeria, Angola, Argentina, Armenia, Austria, Azerbaijan, Bangledesh, Belarus, Belgium, Benin, Bosnia and Herzegovina, Brazil, Bulgaria, Burkina Faso, Cameroon, Canada, Chile, China, Colombia, Congo-Kinshasa, Costa Rica, Côte d’Ivoire/Ivory Coast, Croatia, Cuba, Czech Republic, Ecuador, Egypt, England, Finland, France, Greece, Guatemala, Guinea, Honduras, Hungary, India, Indonesia, Iraq, Iran, Ireland, Israel, Italian, Jamaica, Japan, Kazakhstan, Latvia, Lebanon, Liberia, Lithuania, Luxembourg, Malawi, Malaysia, Malta, Mauritania, Mexico, Morocco, Nepal, the Netherlands, Nicaragua, Niger, Nigeria, Norway, Oman, Pakistan, Panama, Peru, Poland, Portugal, Romania, Rwanda, Russia, Saudi Arabia, Scotland, Senegal, Serbia, Sierra Leone, Slovakia, Slovenia, South Africa, South Korea, Spain, Sri Lanka, Sudan, Sweden, Switzerland, Syria, Tajikistan, Thailand, Togo, Tunisia, Turkey, Uganda, Ukraine, USA, Uruguay, Uzbekistan Venezuela and Vietnam. A conference will take place on 21–22 January 2011 on the occasion of the exhibition, discussing the issues raised in NEW POTT. Artists, art historians and theorists, literary scholars, social psychologists, and historians will gather to discuss the forms and content of social-oriented art and related issues. The conference proceedings (edited by Friederike Wappler) will be published by JRP|Ringier Verlag, Zurich. For more information, contact Sandra Höptner at hoeptner [*at*] mischakuball [*point*] com.